My own stomach clenched at the very idea of one of my boys – of any child — spending the whole day at school with an empty stomach simply because there was no food in the cupboard to feed them. I felt tears prick my eyes and very nearly swept the whole shelf into a donation bin. How is it that we have so much and that there are families in our community who don’t have enough food to get them through the day? Did you know that for more than 850,000 Canadians, one-third of whom are children, the holiday menu will be determined by what’s available in the local food bank? If you’re a long-time reader, you know that for the last few years I have been on a nutritional learning curve of my own, learning to cook from scratch and make smarter food choices for myself and my family. I have to admit, though, that I never put much thought specifically into the nutritional content of the food we donate to the canned food drive or the various food hampers put together in our communities. I was intrigued when Loblaw reached out to me to collaborate on a blog post about the importance of choosing nutritious foods and ingredients to donate to local food drives instead of just emptying the cupboards of whatever your family hasn’t eaten. 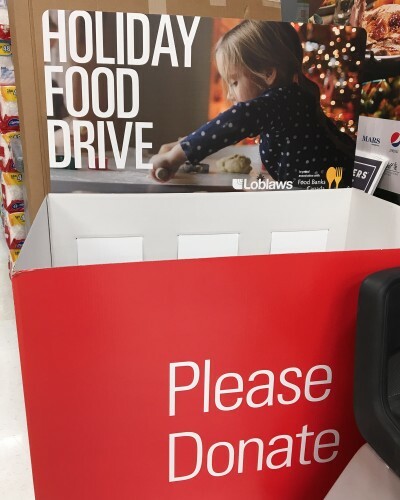 Loblaw grocery stores have been active in promoting and supporting local food drives this holiday season, and have set a goal to raise $1.8 million and 1.3 million pounds of food for Canadians. I’m a big fan of peanut butter donations. Whenever peanut butter goes on sale, I pick up a few for us and a few extra and drop them in the donation bin. 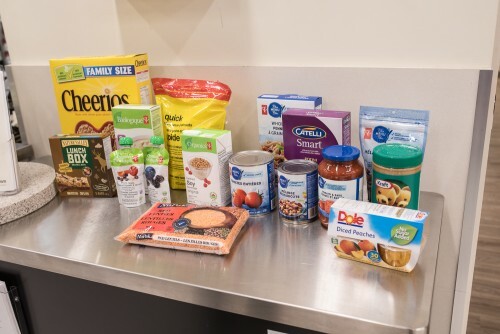 One thing I hadn’t really thought of is that the food banks also serve people with special dietary needs like diabetes, gluten sensitivities and high blood pressure, so donating products specifically for people with dietary restrictions is a great choice. Meal supplements for seniors (like Ensure) are welcome donations. Donating dried beans and legumes or shelf-stable nut milks could be beneficial for vegans and vegetarians. And anything for babies (diapers, wipes, formula, iron-fortified cereals and other baby foods) would help young families in need. Loblaws also has a “guiding stars” program, where foods with more stars point you toward nutritious foods that contain vitamins, minerals, fibre, omega-3 and whole grains versus saturated fat, trans fat, added sodium and added sugar. The more nutritional value a food has, the more stars it receives, so you can look for the two- and three-star foods to help you make nutrition-conscientious food drive donations. While food donations are always welcome, many food banks such as the Ottawa Food Bank are able to make cash donations stretch much further by buying in bulk. Cash donations also allow food banks to invest in perishable items like fresh fruit and vegetables. Each year, my teenagers’ school hosts a canned food drive where they collect tonnes of food for donation to smaller food banks such as the Shepherds of Good Hope. I’ll be more conscientious next year when making my donations, and resist the urge to simply reach into the back of the cupboard for the food we haven’t gotten around to eating. In fact, Loblaws has provided compensation for this blog post, and I want to use part of that to take the boys on a dedicated trip to do some shopping specifically for our local food bank via the bin at the Loblaws here in Manotick. I have some great ideas on which foods I want to pick up! I can talk to the boys about the importance of giving AND squeeze in a lesson about healthy food choices, too. That’s a win-win! Disclosure: I was compensated for my time in researching and writing this blog post. However, as always, all opinions are my own. Very helpful, although I almost always do the cash donation thing because I know food banks can stretch a dollar into way more food than i can. Funny you mention this Allison. At our school council meeting, we discussed this with regard to the St Mark food drive, and the students who organize it were told that this is true for the larger food banks such as the Ottawa Food Bank, but the local food cupboards and, in their case, the Shepherds of Good Hope, welcome donations as well.